Tyson Gay brought the curtain down on an incredible weekend of sporting action for Manchester with a sensational sprint through the City Centre. He blitzed his way down the temporary track on Deansgate to reward thousands of supporters who braved the rain during a breathtaking day of Sport in the city. World and European heptathlon champion and Olympic 2012 favourite Jess Ennis returned to the track after injury, delighting the crowd in the 150m sprint and the 100m hurdles. They were just two of the stars on show as Manchester produced a Great Day of Sport, consisting of the Bupa Great Manchester Run, the British Gas Great Salford Swim and the Powerade ION4 Great City Games. Millions watched across the nation on BBC television as some of the greatest athletes in the world joined forces with more than 40,000 runners and swimmers who combined to raise more than £3 million for a host of charities. Brendan Foster, Chairman of event organisers Nova International said “It was a brilliant day, a success from start to finish and even though the conditions tested our athletes everyone was determined it would not stop the show. 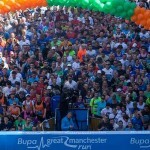 “The atmosphere on the streets of the city was incredible for the Bupa Great Manchester Run and proves this is the nation’s favourite 10k running event. “The British Gas Great Salford Swim was a spectacular event and shows how popular the challenge of open water swimming has become. 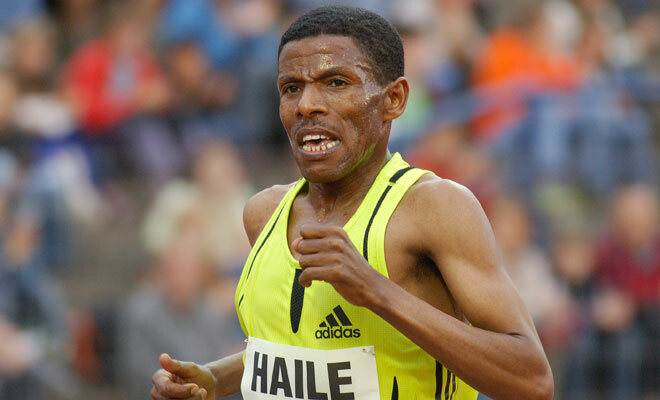 Haile Gerbrselassie led the Bupa Great Manchester Run from start to finish, holding off the challenge of Briton’s Chris Thompson over the 10k course to win in 28 minutes and ten seconds. Recently crowned European indoor 3,000 metre champion Helen Clitheroe clinched the women’s crown with a superb display of running winning emphatically in 31 minutes and 50 seconds. Thousands of runners of all abilities followed in their footsteps as the streets of Manchester were flooded with runners raising money for good causes. British Olympic medal hopeful Keri-Anne Payne and nine time world champion Thomas Lurz produced stunning displays at British Gas Great Salford swim to lead home their respective fields. They featured in a day packed with 2,000 amateur swimmers over the one mile outdoor swim as millions watched on television. The fun-runners and swimmers were joined by scores of famous faces as four teams of celebrities, led by captain’s Nell McAndrew, Dean Andrews, Will Ash and Tony Audenshaw took part in a special Great Day of Sport celebrity challenge. A celebrity represented their team in each event, the Bupa Great Manchester Run, the British Gas Salford Swim and the Powerade ION4 Great City Games and were awarded points for their finishing position. Former Hollyoaks actor and Strictly Come Dancing star Ricky Whittle blew the opposition away, including former Olympian Derek Redmond, Dalton Grant and swimmer Mark Foster in the final event, the sprint challenge, but it was Fosters team who took the celebrity crown. The Great Day of Sport culminated in an afternoon of top class sprinting along the specially designed course for the Powerade ION4 Great City Games featuring Tyson Gay, Olympic 400m holder Christine Ohuruogu, Jess Ennis and European and Commonwealth Games gold medalist Andy Turner. More than 231,000 miles were run during the Great Day of Sport, more than nine times around the world and 2,000 miles swum during the Great Day of Sport. Councillor Mike Amesbury, Executive Member for Culture and Leisure at Manchester City Council said: “Once again the Bupa Great Manchester Run and Powerade ION4 Great CityGames have demonstrated what a remarkable sporting city Manchester is, attracting both top names from the world of athletics and tens of thousands of enthusiastic amateur runners. I’d like to congratulate every last one of them. I’m sure there will be a lot of happy memories as well as sore feet.